Oil on canvas, 16 x 16 in. ; signed l.r. "R. H. Johonnot"
Many California painters could be accused of being “decorative” but the little-known Ralph Johonnot was intentionally so. Before 1912 he taught decorative and applied design at the Pratt Institute (a private art/technical school with branches in Brooklyn and Manhattan) and then settled in Pacific Grove on the Monterey Peninsula. Reviewing an exhibition of the work of Johonnot, his wife and several students at the Artists’ Co-operative Galleries in NY in 1922, a writer claimed the artist’s goal was to paint works that fit in with the entire scheme of a room rather than to paint photographic landscapes that had to be forced into a setting. Johonnot was at heart a designer emerging from the turn-of-the-twentieth century Arts & Crafts mentality and as such was interested in the decoration of two-dimensional surfaces. To the reviewer he described his work as “individual”. Further, writes the reviewer, “The landscapes are more like illustrations for a fairy tale – there is much that is purely imaginative about them.” As for the colors, which are chosen to give a certain color note to a room, the reviewer calls them “elusive,” and “restrained” “no real reds or yellows, and the blues are notes between violet and blue or blue and green and yellows, like sunshine.” “There is no reason why the glorious color effects of the garden should not be carried into the homes as a furnishing of the room. Through color and the poetry of patterns there is so much opportunity of putting individuality into the useful things of our homes”. (NY Times November 16, 1922). 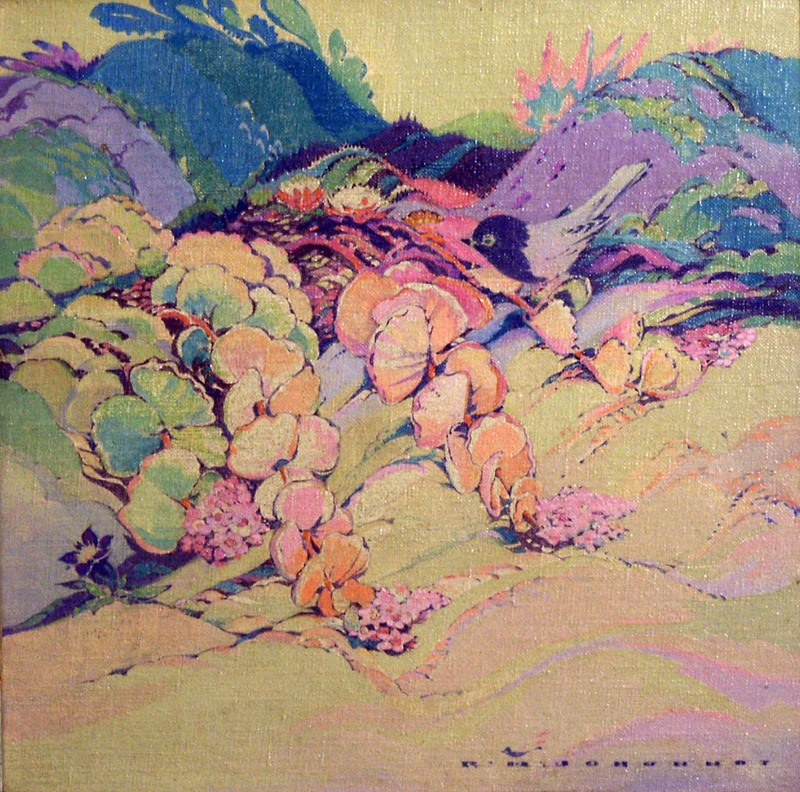 In 1913, 1917, 1931, and 1937 Johonnot traveled to Pasadena in Southern California to lecture and hold exhibits of his painting and handicraft. During the 1930s he ran an artists’ supply shop in Carmel and taught art privately. He also produced color woodblock prints.